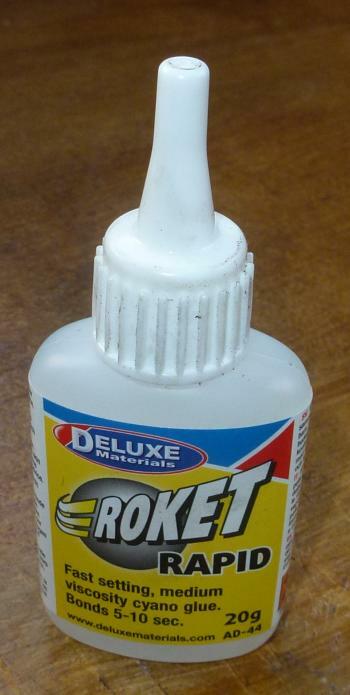 A high quality instant glue. High quality, triple-distilled variety for the best adhesion to a wide variety of materials. Perfect for most applications this the medium thickness formula. Supplied in a Fluorocarbon treated bottle for anti-clog action and extended life – the Fluorocarbon treatment blocks moisture coming through polythene (Prevents moisture penetration). This is described as a “medium” cyanocrylate glue, but compared to the cheaper instant glues this is much thicker. I have used this glue on wood, metals and various fabrics and leather when I have been challenged to fix one the kids school bags or their shoes. You need to keep the nozzle clean and it is best to wipe the nozzle with a cloth to remove excess glue before replacing the top. If glueing two pieces of wood together then I find it best to moisten one part and apply glue to the other, the bond is then formed much quicker – be careful though as this can result in a white residue. This is not your normal instant glue and most definitely not the variety you buy for £1 on the market. This is a professional instant glue and this medium viscosity one is great for general use in the workshop. The glue bond is very strong and although this glue is quite expensive it lasts much longer than the cheaper glues and the results are much better. DeluxeMaterials.com – various glues and other model making materials and kits available on their website.